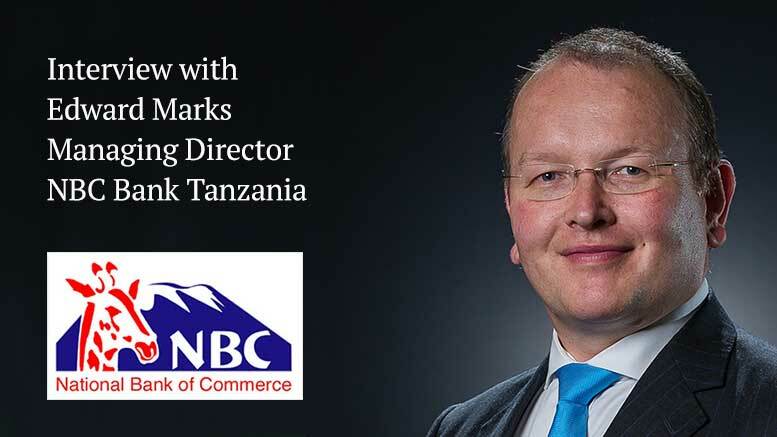 TanzaniaInvest had the pleasure of interviewing Edward Marks, Managing Director of NBC Bank Tanzania, the oldest bank in the country and the 3rd largest by assets and market share. Barclays Africa Group Limited holds 55%, while The government of Tanzania holds 30%, and the remaining 15% is held by the International Finance Corporation (IFC), a member of the World Bank Group. Prior to his appointment in May 2015, Marks served as Managing Director of Barclays Bank Egypt where he led the bank through a difficult operating environment. In this exclusive interview Marks discusses the challenges and opportunities in the Tanzanian banking sector and the role and strategy of NBC. TanzaniaInvest (TI): There are approximately 53 banks, not including other financial institutions in Tanzania in spite of limited banking penetration. The sector is currently affected by credit squeeze and increased Non-Performing Loans (NPLs). What is your assessment of the situation and how has NBC been performing in the midst of the overlying situation? Edward Marks (EM): As a bank, we were quite proactive in Quarter 1 2016 and as a result we had one of the best liquidity position in the market in Quarter 3 and Quarter 4. This is because we predicted the incoming liquidity challenge and we bought bulk deposits, which tightened our budget but provided us with extra liquidity; this allowed us to be able to lend and execute large deals in those challenging conditions. That said, the new incoming capital requirements expected in 2017 are going to impact the banks nationally and we are all forced to evaluate our decisions around whether to lend or keep our capital. In as much as the liquidity challenge will continue, we are also concerned with Non-performing loan percentage. We have already come up with a plan, in conjunction with the Bank of Tanzania on how to get back to the 5% threshold [of NPLs set by BOT]. However, 5% is a chosen figure, it is a KPI that shows that the banking sector portfolio is in good health. Market conditions can cause upswings so it is normal to be above. The trick is how to bring it down quickly. Overall, banks can be profitable even with higher levels of NPL. This is because banking is a business of risk and reward and when you take risks, you will have some losses. TI: Interest rates applied by banks are pretty high in Tanzania. What is the correlation between high NPL levels and high interest rates? EM: It is logical for banks to set higher interest rates to cover their losses when NPLs are present. However, what really drives interest rates is supply & demand and when the government announces the budget and the amount it will borrow from T-bills, it is setting the demand, and as mentioned earlier we (banks) are all conserving capital to meet new requirements & with increasing NPLs the supply side is restricted as well. TI: NBC offers a wide range of services, including retail, business and corporate banking, and treasury. Which segments have proved to be more profitable in 2016? EM: Retail banking has been very profitable but each of our segments has been profitable during 2016. Corporate banking took the interest expense hit because we bought large corporate deposits, which led to improved liquidity. TI: The banking penetration in Tanzania is still very low; nonetheless, the use of mobile money is rapidly growing. What is your take on that and how is fintech going to impact your growth? EM: Banking in the traditional sense is indeed quite limited in Tanzania, but financial inclusion has improved dramatically, thanks to the spike in the use of mobile money provided by mobile network operators (MNOs). The advancements in technology have also contributed to an increase in banking penetration, and are morphing the linkages between banks and MNOs. We already see banks acquiring mobile licences and I see the merging of banks & MNOs inevitably happening at some point. There are opportunities happening in the coming year where the MNOs will list 35% of their capital. I think that the retail appetite for this is going to be extensive and from an investment bank side NBC will be active in the advisories of these IPOs and the collection of the subscriptions from Investors. TI: What is NBC’s strategy for 2017? EM: Our strategy has been deliberately spent on fixing our core systems and introducing technological improvements to ensure that we run efficiently, which in the end drives sustainability and improves our customer’s experience. Consequently, we have also been investing in our people, providing real career ladders & attracting the best from the market when we have to. We now have a comparable e-footprint to other banks, providing internet banking, mobile payments and other paperless banking services like cash management and business banking advisory services among others. The plan for 2017 is to bring in even more bridging innovations to Tanzania, contributing to the country’s financial inclusion agenda and empowering Tanzanians. Our main drivers will be in the retail, business banking with select corporate / investment bank with large deals. In the retail space it will be all about making banking easier and accessible through alternate channels. We are also quite invested in the SME segment, from a commercial and a CSR perspective. We will be investing in entrepreneurial and financial skills and offering advisory services to nurture infant SMEs. TI: What are your ambitions and what are the challenges ahead? EM: In 2015, our profit was TSH 17.6b. In 2016, we grew that by 32%. We are going to be selective in our choice of liabilities. We are not buying expensive deposits, so you’ll see us focus on current accounts, and we will consequently try to make them interest-bearing. We will bring in new products and put more capability into electronic platforms. Payments are also key because they will keep the currents account balanced. So, it is all about current accounts and fast execution of payments. We also want to keep our liquidity, enabling us to execute deals in the infrastructure sector and with the large corporates. I foresee our biggest challenge being the balance between asset growth and capital position. This is because every asset creates risk-weighted assets, which in turn means that we have to set aside more capital. Tanzania is evolving quite fast; I believe the government efforts in curbing corruption and driving revenue collection is the right thing and is setting an efficient base for the country’s progress. We are confident about the future and we will keep on making bountiful leaps in the banking sector in Tanzania.